The New York Yankees' 2007 season was the Yankees' 105th in New York and their 107th overall dating back to their origins in Baltimore. The season started with the Yankees trying to win the AL East championship, a title they had won every season since after the 1997 season, but ultimately they came in second place to the Boston Red Sox. The Yankees instead won the American League wild card, beating out the Seattle Mariners and the Detroit Tigers. The offseason started with news of the unexpected death of Cory Lidle, who was an occupant in his own plane that crashed into a Manhattan high rise shortly after the Yankees were eliminated in the 2006 ALDS. 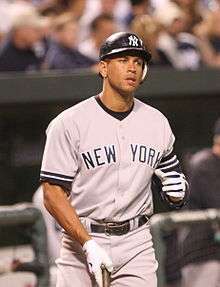 The Yankees made news by trading right fielder Gary Sheffield to the Detroit Tigers in exchange for pitching prospects. The Yankees also traded away pitcher Jaret Wright to the Baltimore Orioles in exchange for reliever Chris Britton. On December 21, 2006, Andy Pettitte signed as a Free Agent with the Yankees. However, no offseason move was bigger for the team than trading Randy Johnson back to the Arizona Diamondbacks, the team who he was with when he won the 2001 World Series against the Yankees, for pitcher Luis Vizcaíno and three minor league prospects. Joe Torre is managing the team for the 12th consecutive season. On May 6, Roger Clemens announced his return to the Yankees after a three-year absence from the team. Injuries sidelined starting pitchers Mike Mussina, Carl Pavano, and Chien-Ming Wang, leaving only original starters Andy Pettitte and Kei Igawa active. The team set a major league record with 10 different starters in the first 30 games, including a record 6 rookies. Even the rookie hurlers were not immune in the early going. Jeff Karstens was hit by a line drive off his first pitch on April 28, fracturing his right fibula. Phil Hughes pitched a hitless 6⅓ innings against the Rangers on May 1 before leaving the game with a pulled hamstring. Closer Mariano Rivera blew 2 of his first 3 save opportunities and struggled in other appearances. Kei Igawa, acquired during the off-season for $46 million from Japan's Hanshin Tigers, allowed 26 earned runs in 6 appearances for an ERA of 7.63. He was then sent to the Tampa Yankees, the Single A affiliate of the Yankees. Meanwhile, the offense led the American League in hits, home runs, and runs scored. Alex Rodríguez tied a record (set by Albert Pujols), by hitting 14 home runs in April. Nonetheless, the Yankees suffered a seven-game losing streak after sweeping the Cleveland Indians at Yankee Stadium and ended April with a record of 9–14, last place in the AL East and 6½ games behind the Red Sox. By early May, Mike Mussina and Chien-Ming Wang joined Andy Pettitte with newcomers Darrell Rasner and Matt DeSalvo filling in the remaining two positions in the rotation. Alex Rodriguez's remarkable April had come to an end, but the bats kept up their pace and, with the bullpen getting some needed rest, the Yankees began May 7–2. However, at the end of the month, the Yankees were tied for last place with the Devil Rays and were 22–29, 13½ games behind the Red Sox in the AL East. On May 6, Roger Clemens announced his return to the Yankees after a three-year absence from the team. The Yankees began June with a strong 8–2 start. They opened with a series victory over the Red Sox in Boston, including a game-winning home run by Alex Rodriguez off closer Jonathan Papelbon in the final game of the set with Boston. They were struck by injuries again that weekend, as Doug Mientkiewicz was injured in a collision at first with Mike Lowell and Roger Clemens's first start was delayed by a groin injury. Nonetheless, the Yankees took 3 of 4 from the White Sox heading into an interleague series with the Pirates. Roger Clemens made his season debut on June 9 and earned the victory. The Yankees swept the Pirates and took a 9-game winning streak, their longest since May 2005, into a subway series with the Mets. Roger Clemens pitched strongly in the series opener, but the Yankees were shut out 2-0. The Yankees would rebound and take the next game 11–8. Later that day, the Yankees received news that Kei Igawa would be ready to return to the Major Leagues. On July 1, they were 11 games behind the division-leading Red Sox and 8 games behind the Wild Card-leading Tigers. The Yankees began the first week of July strongly. They lost the final game of a series with Oakland before taking 3 out of 4 from the Minnesota Twins and 2 of 3 from the Los Angeles Angels of Anaheim. Alex Rodriguez was injured during the series with Minnesota, suffering a strained left hamstring. He missed one game before returning to action that weekend against the Angels. After winning the weekend series with the Angels, the Yankees went into the break with a 42–43 record and a 10-game deficit in the division behind the Boston Red Sox. This is the first time since 1995 that the New York Yankees were under .500 before the All Star Break. After the break, the Yankees took three out of four games from the Toronto Blue Jays and the last place Tampa Bay Devil Rays, twice. In the month of July, the Yankees traded Scott Proctor for Wilson Betemit of the Los Angeles Dodgers. The Yankees also traded Jeff Kennard for Jose Molina. The beginning of August saw the Yankees, along with all of Major League Baseball, eagerly awaiting home run number 500 from Alex Rodriguez. During the home run milestone chase George Steinbrenner's health once again came into question when the New York Post and the New York Daily News each reported that Steinbrenner, during a recent interview, appeared to be suffering from dementia. “ [Steinbrenner] repeats, "Great to see ya", each time McEwen, 84, asks different questions about the Boss' family members. After gruffly responding to the Condé Nast reporter's question about the Yankees, he continues to repeat "Great to see ya", to each of McEwen's questions. On August 4, 2007, during the first inning Alex Rodriguez hit his 500th career home run. Rodriguez became the youngest player ever to do so at 32 years, 8 days. On August 6, 2007, the Yankees cut relief pitcher Mike Myers and brought up Jim Brower. They had just completed a season sweep of the Cleveland Indians, winning all 6 games they played against them in 2007. This was a good start to the Yankees' upcoming tough schedule, where they played 17 games out of a 20-game span against playoff contenders. This included 8 games against the Detroit Tigers (4 at home, 4 at Detroit), 3 games against the Cleveland Indians, 3 games against the Los Angeles Angels of Anaheim, and 3 games against the Boston Red Sox. August also saw rookie Phil Hughes rejoin the starting rotation, as well as the much anticipated debut of Joba Chamberlain, a future starter who gave the Yankees' bullpen some much needed help during the pennant race (an 0.38 ERA in 23.2 innings). Hall of Fame Yankee shortstop Phil Rizzuto, who was also the long-time voice of the Yankees on television and radio, died on August 13. The Yankees wore his number 10 on their left sleeves for the remainder of the season. The Yankees swept Boston at Yankee Stadium after dropping to eight games back in AL East standings. Coupled with losses by the Seattle Mariners, the Yankees' wins put them on top of the AL Wild Card race. The Yankees' first game of September showcased rookie pitcher Ian Kennedy in his first career Major League start. Kennedy had replaced veteran Mike Mussina after Mussina had struggled in his previous three starts. Over seven innings pitched, Kennedy was charged with three runs, only one of which was earned, and the Yankees' offense was led by Alex Rodriguez's 45th home run of the season on the way to a 9–6 victory over the Tampa Bay Devil Rays. The game against the Boston Red Sox on September 14 was 4 hours and 43 minutes, 2 minutes short of a nine inning game record, which is held by the Yankees and Red Sox. While the Yankees lost the American League East title to the Boston Red Sox on September 27, the Yankees clinched the wild card berth and appeared in the postseason for a 13th straight year. They faced the AL Central champions, the Cleveland Indians, in the ALDS, losing the series three games to one. Andy Pettitte was one of the pitchers on the Yankees' 2007 roster. On October 14, 2007, George Steinbrenner relinquished control of the Yankees to his two sons, Hank and Hal Steinbrenner. The brothers will take on control not only of the Yankees but also the YES Network and the construction of the new Yankee Stadium. "I'll pay more attention to the baseball part", Hank Steinbrenner said. "The stadium, that's more Hal. But basically everything will be decided jointly." Technically, Steinbrenner is not completely gone. He has given himself chairman-like position on the team. "George has taken on a role like the chairman of a major corporation", team president Randy Levine told the New York Post. "He's been saying for years he's wanted to get his sons involved in the family business. Both of them have stepped up and are taking on the day-to-day duties of what's required to run the Yankees." After the Yankees were eliminated the postseason, the fate of Joe Torre, the Yankees' manager since 1996, was in question. The team mulled what to do while speculation grew that Torre would not be brought back as manager. The team eventually offered him a contract that had a reduced salary with incentives, but Torre, who felt he was being treated unfairly even after his long tenure with the team, rejected the offer. He subsequently was hired by the Los Angeles Dodgers. The Yankees would hire Joe Girardi as Torre's replacement. ↑ "Yankees have deal to send Johnson back to Arizona". Archived from the original on January 8, 2007. Retrieved January 5, 2007.